Who was the true Freshman of the Year? Re: Who was the true Freshman of the Year? ROCK THE VOTE! Very interesting second round matchup ... get there and vote it up daily! 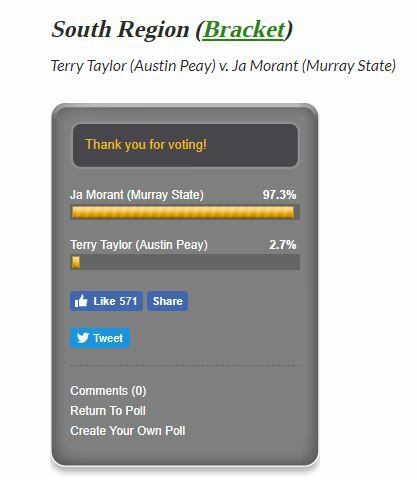 In the John Stockton Bracket, you can now vote for Jonathan Stark here! They each got my 4 votes daily. Mahoney and Mayo still in it too. Don't forget to vote for Jonathon, looks like he has some competition. Denzel Mahoney and Nicky Mayo can use some help. I did, thanks cause I need daily reminding lol. Need to vote. Ja is down right now. He's up now, but keep voting. I forgot to vote last two days myself. Make sure you vote for Jon too. Make sure you vote today as Jonathan is down. Don't forget to vote for Stark here, on Facebook, and Twitter. Custer is still in the tournament, and he is about to erase a 30 point lead from yesterday. Don't forget to vote. With Custer still playing there will be a surge after Loyola's next game.